I have recently started reading The Divine Commodity by Skye Jethani (so far I highly recommend this book). And that book has sparked these thoughts. I have been deeply involved in the Church and Culture discussion throughout college and my professional career inside the church. This is a discussion that needs to happen and continue. Should culture be levied in order to teach the world about God’s love and Grace? Should we remain separate from culture completely? There are no easy answers to these questions and if you can simply choose one and dismiss the other then you need to re-examine yourself. We have probably all seen the Christian knock offs of Cultural Icons – Have you driven the Lord Lately? Jesus, That’s my final answer – and while these products are created with the best intentions and serve as uplifting and motivational for a % of Christians they end up presenting the Christian faith in the same light as the “Rolex” watch you haggle for on the streets of New York (which in my opinion is one of the best parts of New York – there is nothing more fun than haggling for worthless junk). We have all also probably seen Christianity and Culture in a warm embrace and presented in a way that worked for you. I know a number of larger churches that present the relationship between Christianity and Culture in a professional and polished way that is effective to both the seeker and the seasoned at the same time. The best sound equipment, coolest graphics, hollywood quality video productions, and more all to further the kingdom of God. Skye writes “The emergence of a Christian subculture that parallels the secular culture in every way reveals the captivity of our imagination. And George Barna writes “American Christianity has largely failed since the middle of the twentieth century because Jesus’ modern-day disciples do not act like Jesus.” How is this so? As Christians, we are very creative, but not so imaginative. What does that mean? We have so much creative talent that is being wasted by recycling the cultural imagery but we can’t imagine anything outside that box. We serve a creative God, we create because we were created. We have intimate access to the greatest story in Human history – Creation, Fall, Redemption, ReCreation. We are created in the image of a God with the capacity to imagine everything that exists around us and yet we neglect our imagination in order to create what people are all ready consuming. That my friend presents a problem. There is no right or wrong answer (as far as i can see) as whether or not to levy culture in order to share God’s Love. That being said, let’s not neglect our imaginations. The greatest story ever told doesn’t exist from storytellers who don’t know it. The optimist sees a glass half full. 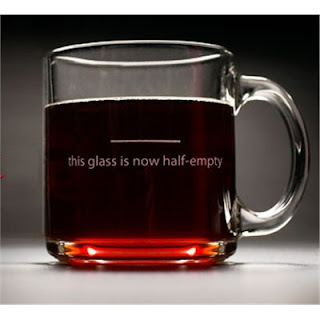 The pessimist sees a glass half empty. The cynic sees a glass with dirty water. The realist wonders if you poured into the glass or out of the glass. The philosopher would ponder if there really is a glass with anything in it. The scientist sees a 500ml glass with 250ml of liquid. The physicist would say that the volume of this cylinder is divided into two equal parts; one a colorless, odorless liquid, the other a colorless, odorless gas. Thus the cylinder is neither full nor empty. Rather, each half of the cylinder is full, one with a gas, one with a liquid. The seasoned drinker would say that the glass doesn’t have enough ice in it. The plumber checks for a leak. The engineer sees a glass that is twice as big as it needs to be. The banker would say that the glass has just under 50% of its net worth in liquid assets. The agnostic doesn’t seem to care either way. The Christian sees a lack of joy. There has been a lack of activity recently, i know. I have been spending much time as of late working on my thesis for school. This has led to a number of sleepless nights and piles of books strewn across my home office floor. So here is a quick look into my world as of the past few months. My thesis is exploring the idea of “Short Film as a New Medium for Worship.” There has been a recent trend of short films/videos being created and produced specifically for the Church. These films act within the worship service as part of the worship in the same way that visual art has done through history. Broadly worship encompasses any number of actions, services, sacrifices, or more so i had to specifically focus on the worship/liturgy of the church. More specifically I focused on the happenings between the beginning of and end of service. This includes – but is not limited to – music, sermon, offering, greeting, prayer, and doxology. This emerging phenomenon works in conjunction with and in place of certain elements of the worship service. Rob Bell’s Nooma series acts within the Short Film as Teaching category i have devised for the purposes of my thesis. Other categories i have created to help develop a working framework are Short Film as Testimony or Story (i.e. Erwin McManus’ “Crave” and “Wide Awake”) and Short Film as Illustration (more colloquially sermon support – see SermonSpice.com, wiredchurches.com, and others). The other side of my thesis work will be creating three short films to help illustrate my thesis’ theological critique and reflection of this emerging discipline. Those i will share later as i finish them over time. One interesting insight that, along with my thesis committee, i have come across is this idea of Film working in a similar fashion to the storied stained glass windows. Historically, stained glass windows have been more than just decoration, telling biblical stories, carrying theological ideas through a series, and creating a sacred space. What is film other than colored frames that tell a story as light passes through them. The story and theology is dependent on the creator. And as part of the modern advent of this trend, film has helped shaped our new sacred spaces. In a sense film in the church is acting as the new stained glass windows for a new generation. My Grandfather loved praise and worship music. At the age of 81 he stood in the back of our little church and would clap his hands to every song that was played. Of course my grandfather had no rhythm and managed to clap completely off beat at all times. As hard as it may have been to be standing next to him, his intention was understood. In the Bible we find clapping mentioned 9 times (all old-testament). all of these occurrences are are some combination of the four hebrew verbs used to express the “striking” of something (macha, naka, saphak, taqa) and the Hebrew word for “hand” (kaf). Essesntially it means the striking of hands, or clapping. 5 of the 9 times we see these combinations, clapping has a negative connotation. These five places use the clapping of hands to show anger, scorn, and disgust (Job 27:23; 34:37, Lam. 2:15; Ezek. 25:6; Nahum 3:19). We still see this today when we make a bad choice or do something we might consider stupid, we clap our hands in disgust. The other four uses however, are meant to show joy, celebration, and praise (2 Kings 11:12; Ps. 47:1; 98:8; Isaiah 55:12). Two of these passages speak of nature giving praise by clapping it’s hands through rivers and trees. How majestic is our God that “all the trees of the field will clap their hands” along with the rivers? If we remember in Luke, Jesus rebukes the Pharisees complaining about the disciples displaying joyful and loud behavior as Jesus cam into town. He said that if these people become silent then surely the stones will cry out in praise. The simple act of placing two hands together repeatedly has such a wide range of meaning. It is one of the first things we learn to do as babies and symbolically is the last moment before life’s curtain call. Let our challenge this month be to realize that if we don’t praise our Creator and Savior that the trees, rivers, mountains, and rocks will. So clap your hands; applaud God’s majesty and greatness, even if it is out of rhythm like my grandfather, as long as it is from your heart. Life can be stressful at times. Wow what a shocking revelation! (if this is a revelation to you please contact me and let me know how you do it) Life in America tends to high-paced. You work and you work and you work some more to provide the best for your family, for yourself, and for others. I know I fall victim to this mind set. I tend to not only light my candle on both ends but figure why not light it in the middle as well. We tend, as life gets busy and hectic, to begin to view life as one goal after another. If I can just make it through monday I will be fine. If I can just make it through mid-terms, finals, this paper, that project; life will get back to normal. What begins to happen is that lifestyle becomes normal. I know at times my lines become cups of coffee; if I can just make it to the next cup of coffee. This happens in church life as well; if I can just make it through the Christmas production, the Easter production; if I can just make it to my next paycheck. We begin to get used to the lines we are determining our life by. One by one they add up. I know I begin to feel trapped, as if those determined lines are creating the bars in my jail cell. We become so focused on each line we forget about the white space in the middle. We don’t live for today and enjoy the blessings that are found in the space between the lines. We tend to do this as Christians as well. We are so focused on heaven we forget about the here and now. We become so wrapped up in the afterlife that we don’t pay attention to life. Let me qualify this by saying that it’s not inherently bad. As Christians we have a perfected eternity to look forward to but I fear that it becomes the only thing we focus on. We sing about it in church, we talk about it when the news is bleak, and we forget that we are called to make a difference here on earth. Our life is a gift and we can’t forget that the time between the lines is just as important (if not more so) than the lines themselves. Tomorrow is never guaranteed. So let us try our best to not define our days, weeks, months, and years by what’s next on our agenda. Let’s take the time to stop and smell the roses as they say. If the sparrows don’t worry about the next meal and the flowers of the field don’t care about the next church production then maybe we as Christians can live between the lines as well. I am 26 years old. This is the third election I have had the privilege of participation. And what an election it turned out to be (not to mention it has seemingly taken 2 years worth of an election). More excitement and electricity have surrounded this election than any i can remember in my life. No matter who won the election, history was going to be made. I had made up my mind weeks before the election. I dug for information and voted early for the candidate that i felt would best represent my thoughts and beliefs. But as an American I made up my mind to support and pray for whichever candidate won. It is our American right to voice our opinion but it is also our duty to support our president. That doesn’t mean we have to agree but we should be supportive. I think of McCain’s concession speech where he urges both parties to come together in this time of need and I too hope that each one of us can look past politics and come together as a church and a nation. This is a sneak preview of our new installment of Derek and Derek in the morning – originally our slight spoof of Mike and Mike in the Morning from ESPN and a great way to deliver the morning announcements. I will go into more detail later but let’s just say that we decided to stay current with the times and move to a Derek and Derek debate format in light of the recent Presidential Debate at Belmont University not too far from us. Let me fill you in with some of the fun facts about this video. As i was driving into work Wednesday (when we normally shoot the regular Derek and Derek) I called to make sure the “talent” was ready. Derek informed me of the potential new idea and we all jumped on board and ran with it. So set up and shot 3 days ago. I created the opening bumper, had a member of our worship band (Scott) compose some original music, and edited thursday and today. We have a very small media department. It basically comprises of Me, one camera, homemade lighting, and whoever i can get on days we shoot which is normally just me but as of late i have had great help from a guy in my small group, Brandon. There are now two of us who do a bulk of the work. But he is a big help – not to mention the other pastors who believe in what we are doing and pitch in to help. enjoy – if i didn’t just wake up from a nap on the couch (fell asleep watching football and waiting for the final product to render out) i may have something way more intelligent to say. What an amazing service we had. Close to 800 people showed up to celebrate the culmination of our 40 Days of Community Campaign. I know personally my small group grew together through our outreach project. We were able to built a new staircase for a family that had to jump off an onto their porch each day. The day was full of great music, great fellowship, a great sermon, and a phenomenal finish – cardboard testimonies. I have to admit that it wasn’t an original idea. We found a video on YouTube displaying this very idea from another church. But we made it our own. Every story you saw was true. Every moment shared was personal to that person holding the cardboard. I did not see too many dry eyes in the congregation. What was it that was represented there that made this day so powerful. It wasn’t the song choices behind it. It wasn’t the emotion displayed by those holding the cardboard, probably the person sitting next to you, and the pastoral staff. It was God moving through our people. It was seeing how people like you and me are able to claim victory through Christ. That’s what made it connect. There was nothing separating those pieces of cardboard from our own stories of pain and suffering. There was nothing separating those holding the cardboard from each of us flipping them over to reveal how God has moved in our lives and rescued us. I can’t wait to finish up the video of the day and share it with anyone who is willing to watch, anyone who is looking for how God is still working today. The creative team at GraceChurch is working on how we can continue to present you with engaging and entertaining events and services that share hope.